BEYOND THE GAME, from director Jos de Putter is finally here, after its long festival tour of the Margaret Mead Film Festival, the International Documentary Festival in Amsterdam, the Vancouver Film Festival, and beyond. 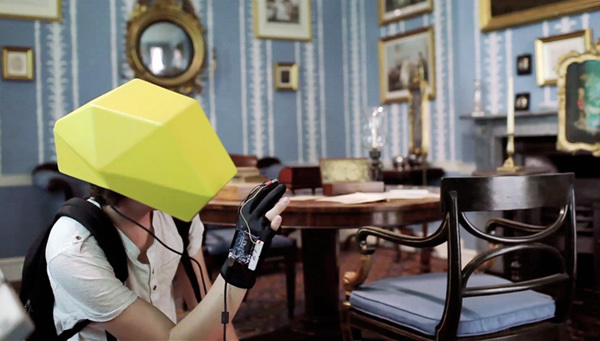 Maxence Parache’s experimental augmented-reality system lets you detach your point of view from your body. We take our first-person visual perspective for granted every second of the day — we have to, because our eyeballs are attached to our heads. But what if you could detach your personal “camera angle” at any moment and float away from your own body while still inhabiting it, like an on-demand out-of-body experience? Designer Maxence Paranche has created the next best thing in his HyperReality system, which uses a Microsoft Kinect to scan your physical environment and display it inside a virtual-reality helmet, so you can rotate the visual angle any way you like. 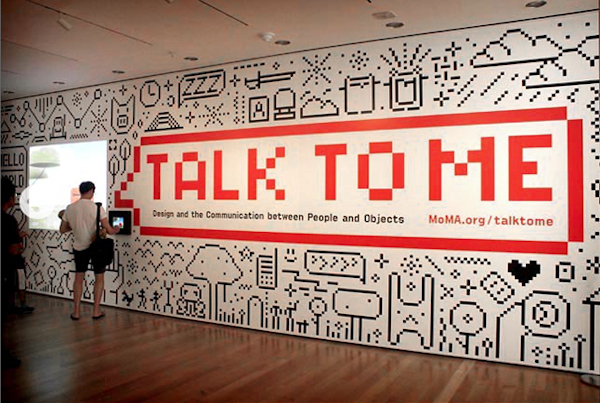 NEW YORK, July 19, 2011—The Museum of Modern Art presents Talk to Me: Design and the Communication between People and Objects from July 24 to November 7, 2011. With nearly 200 projects ranging from the microscopic to the cosmic and all designed in the past few years or currently under development, the exhibition explores design’s new terrain: enhancing communicative possibilities, embodying a new balance between technology and people, and bringing technological breakthroughs to an approachable, human scale. These projects include interfaces, websites, video games, tools, charts, and information systems on topics global and local, public and personal. The exhibition is organized by Paola Antonelli, Senior Curator, and Kate Carmody, Curatorial Assistant, Department of Architecture and Design, The Museum of Modern Art. Whether openly and actively or in subtle, emotional, or subliminal ways, objects talk to people. As the purpose of design has, in past decades, shifted away from mere utility toward meaning and communication, objects that were once charged only with being elegant and functional now need to have personalities. Thanks to digital technology, these objects even have the tools to communicate through their interfaces, adding a new interactive dimension. Contemporary designers, in addition to giving objects form, function, and meaning, now write the initial scripts that are the foundations for these useful and satisfying conversations. 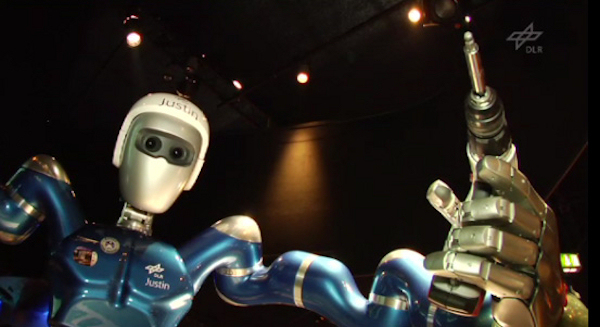 Meet Justin, an android who will soon be controlled remotely by the astronauts in ESA’s Columbus laboratory on the International Space Station. With this and other intriguing experiments like the Eurobot rover, ESA is paving the way for exploring the Moon and planets with tele-operated robots. In two to three years, the experimental robot on Earth will faithfully mimic the movements of an astronaut on the Space Station. One-on-one videoconferencing has likely had the longest time coming to market of any tech product since it became viable as a technology. First showcased in the 1960s, I participated in the first large trials at Apple that started in the late 1980s. While desktop cameras proliferated on notebooks and as USB peripherals, for much of the last two decades, people have rarely performed video calls. WebEx and Microsoft’s Live Meeting have had video capability for several years now and Skype has had it far longer, yet folks just don’t choose to use these features. Large-room videoconferencing has been under deployment for nearly two decades and it is currently backed by Cisco, but HP recently exited the business selling it to Polycom, which has acquired a massive number of similar companies over the last couple of decades to become the equivalent of the great videoconferencing graveyard. Conference-room solutions are expensive but, if used properly, can pay for themselves in months in terms of saved travel expense, and yet they are still rarely used. Desktop videoconferencing systems have been around for over a decade and are both cheap and relatively easy to use. If we really like to communicate by seeing people, why hasn’t desktop videoconferencing taken off yet? Few could predict just how fast and dramatic the social, economic and political impacts of computer technology could be in our lifetimes. If present trends are to continue, computers will have more advanced and powerful ‘brains’ than humans within 25 years. This August, leading scientists, inventors and philosophers will gather at RMIT to discuss the upcoming ‘intelligence explosion’ that many now refer to as ‘The Singularity’- a technological breakthrough that promises to eclipse previous computing developments with the creation of super-human machines. The ‘Singularity Summit’ – a part of National Science Week – is an unprecedented opportunity to engage with today’s leading experts on emerging technologies like Artificial Intelligence (AI), robotics, nanotechnology and brain-computer interfaces – right here in Melbourne. As a pre-summit launch, the Australian premiere of documentary ‘Transcendent Man’ – featuring leading futurist, singularity advocate and recent Time Magazine cover star ‘Ray Kurzweil’ – will be held at Nova Cinemas, Carlton on August 19. The screening will also feature a prerecorded message to Australia from Ray Kurzweil and producer Barry Ptolemy, and a Q&A session with documentary participants and Internationally renowned Artificial Intelligence (AI) experts – Dr Ben Goertzel and Dr Hugo De Garis – both of whom will also be presenting at the summit. The 2010 Singularity Summit drew over a hundred local, interstate and international enthusiasts to hear first-rate speakers from a range of fields. In 2011, we have again assembled a stellar line-up – Including leading Artificial Intelligence experts Dr Ben Goertzel and Professor Steve Omohundro, popular scientist Dr Lawrence Krauss and renowned philosopher Dr David Chalmers. This years summit will also feature exciting robotic demonstrations by Professor Raymond Jarvis, and others. The summit will explore the important ethical and philosophical dimensions of the Singularity – whilst sharing the very latest scientific and technological breakthroughs. You only have to be the parent of a child over the age of seven to know what I’m talking about: the vacant eyes so preoccupied by what’s on screen that they can’t focus on your face for more than a few seconds before being drawn back into the cyberworld. A study last year by the Kaiser Family Foundation in the US found that children from eight to 18 spend more than 7½ hours a day online and/or using electronic devices. And that doesn’t count the hour and a half that youths spend texting or talking on their mobiles. Because so many of them are multitasking – chatting on Facebook while playing games, surfing and texting – they pack an average of almost 11 hours of media content into that seven and a half hours. Some psychologists call this behaviour addiction; the Federal Government is investigating the effects of internet use on young Australians. British scientist Susan Greenfield, professor of synaptic pharmacology at Lincoln College, Oxford, believes that the pre-frontal cortex, which governs empathy and compassion, needs social nourishment in order to grow and develop synaptic connections. This starts with the mother’s gaze, the incredible stare of love that stimulates the brain. It is further developed by gazing at, and with, other people through smiles, sneers, flushes and changing voice tone, along with social skills such as reading. Greenfield even refers to pheromones, the smells we emit that give signals to others. But before mums and dads are tempted to pull the plug on all this new technology, there’s a twist to the story. Enter Professor Dennis Del Favero, philosopher, artist and director of the iCinema Centre at the ¬University of NSW. With a team of computer scientists, engineers, filmmakers and artists, Del Favero has pioneered technology that promises to transform the interactive experience for the better. Instead of pushing us away from the world, it unites us with it. The technology, which involves interactive multimedia, has attracted worldwide attention. 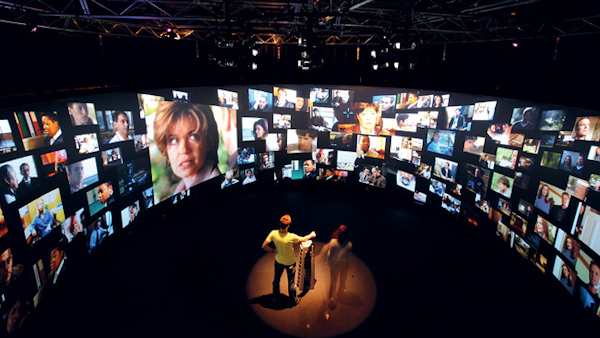 It’s already achieved $7.1 million in sales, most recently to China as a mining industry educational tool; the Museum of Victoria is about to launch a version of it; three universities here and abroad have expressed strong interest; and Hollywood’s Jeffrey Katzenberg, CEO of DreamWorks Animation, inspected the facilities on a recent visit to Australia.